A 27-year-veteran SEPTA employee was struck by a train in Center City this afternoon. It happened around 4:15 p.m. in a trolley tunnel near 22nd and Market streets. The male employee was working on a trolley tunnel project when he was clipped by an eastbound train. He was taken to Hahnemann University Hospital. The trolley lines run parallel to the Market-Frankford Line in that area. Shuttles were operating between 5th and 40th streets.Train service has resumed in both directions on the Market-Frankford Line. Passengers should expect delays. A multiple-vehicle accident this afternoon on Rt. 1 near Route 213 and the Oxford Valley Mall exit this afternoon caused major delays. 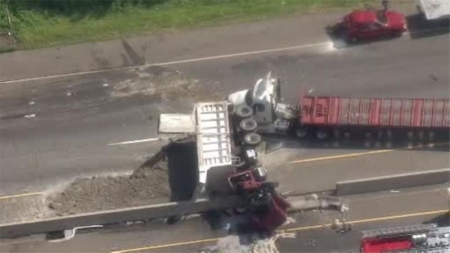 The accident, involving a flatbed tractor trailer and dump truck, happened in the southbound lanes around 3:30 pm causing the dump truck to topple over on it's side spilling its load. Two injuries have been reported and the victims have been transported to the hospital. A driver crashed into a toll booth on the Pennsylvania Turnpike late this afternoon in Bristol, Bucks County. 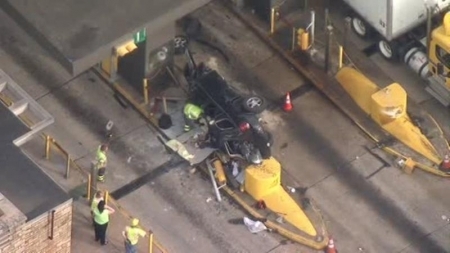 The accident happened at 5:15 pm as the vehicle was approaching the tollbooths in Lane 1 at the Delaware River Bridge interchange heading into Pennsylvania. They had to be rescued by emergency crews and were taken to St Mary's Hospital suffering head injuries. The accident caused major delays for traffic headed over the bridge connecting from New Jersey. Mostly Cloudy, temperatures in the Mid to Upper 70's this evening in Center City.